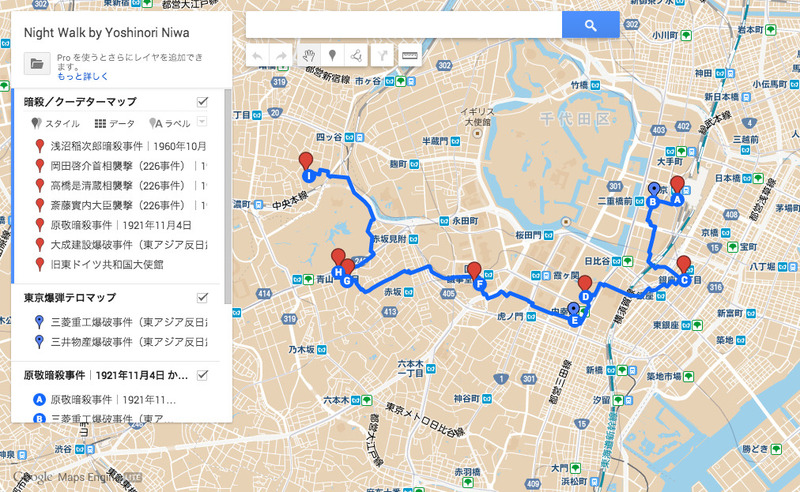 In this tour, participants will be walking through an 8 km-route during midnight from Tokyo station to Yotsuya in search of sites of terrorist attacks and assassinations which took place between the 1930s to 1970s. Around Tokyo station, the east part of the city, the group will visit sites where a series of terrorist bombings at corporate buildings were conducted in 1974 by a left-wing terrorist organization East Asia Anti-Japan Armed Front. The walk will then continue to west tracing the sites of the February 26 Incident, which was an attempted coup d’état to attack the nerve center of the government organized by the right-wing Imperial Japanese Army (IJA) officers. Many of those sites are hardly recognizable today due to the renovation or relocation of the buildings or land selling, and it is not difficult to live in the city without noticing these sites unless you already knew. This night walk is a research event, not yet formed into a project, in an attempt to see the “invisibility of the past” by projecting the historical incidents on a map and actually walking from the left to the right.